Bonus images behind some of these buttons. Support PotB and vote every day! Perils of the Bold updates irregularly. Hopefully once a week. Chinese checkers, as you would not expect, did not orginate in China. Some guy in Germany invented it in 1893 as Stern-Halma. An American renamed it Chinese Checkers to sound more exotic - because Stern-Halma isn't exotic, I guess. So, I don't think it's so bad that the gods have renamed soul checkers. The board and pieces contrast very well with the godscape. The board is very contained, all the pieces remain on it, so I don't have to do as much digital work. The pieces remain firmly in place where they're supposed to be, so I won't mess up the arrange by bumping the board. Panel #5 - That's actually the very tip of my finger on the checker. Panel #8 - Originally, the black checker was going to say "Kind of like when you were alive, huh?" 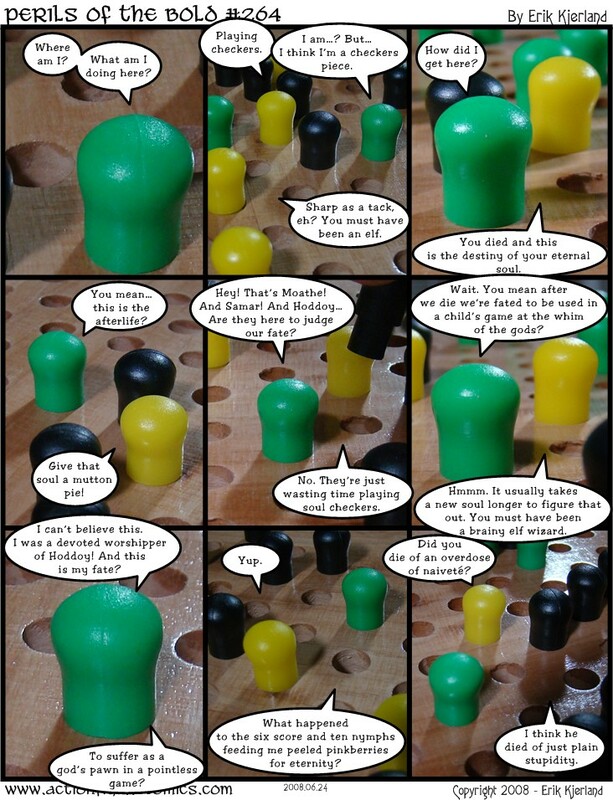 as the punchline, and the green checker was going to respond with "Yeah, I guess you're right." I didn't like that too much. So, I asked Tawni for help and she suggested the joke here in panel #8 and #9 instead! Thanks, Tawny!